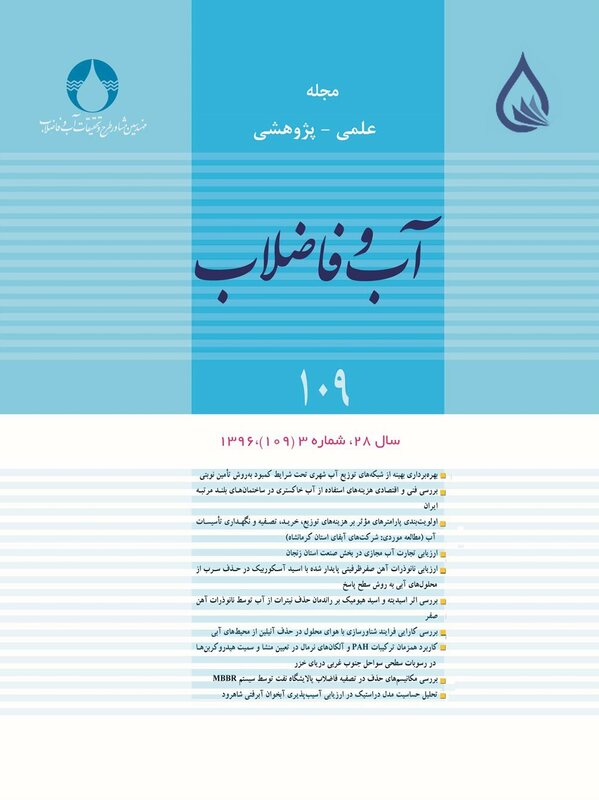 در شرایط کمبود، مدیریت مصرف در شبکه‌های توزیع آب شهری اجتناب‌ناپذیر است. یکی از راهکارهای مدیریتی، بهره‌برداری به روش تأمین نوبتی آب در شبکه توزیع است. بهره‌برداری به این روش، این امکان را فراهم می‌آورد تا با قطع آب برخی از مصرف‌کنندگان در بعضی از زمان‌ها، بتوان در زمان‌های وصل آب، نیاز گره‌های مصرفی را تحت فشار مطلوب تأمین نمود. یکی از مواردی که در تأمین آب به‌صورت نوبتی حائز اهمیت است، رعایت یکنواختی توزیع آب بین مصرف‌کنندگان است. در تحقیق حاضر یکنواختی توزیع آب و تأمین یک مقدار حداقل از آب، برای همه مصرف‌کنندگان به‌ترتیب با عنوان عدالت و انصاف، تعریف شده‌اند. در این تحقیق یک مدل بهینه‌سازی برای یافتن برنامه زمانی بهینه تأمین نوبتی با هدف بیش‌سازی تعداد تأمین‌ها، و همزمان تأمین قیودات مربوط به بهره‌برداری از شبکه‌های توزیع آب توسعه داده شد. برای نشان دادن کارایی مدل ارائه شده، عملکرد آن برای شرایط کمبود آب متفاوت، توسط چندین سناریو در یک شبکه توزیع نمونه دوحلقه‌ای، مورد بررسی قرار گرفت. برای حل مدل بهینه‌سازی از ایجاد ارتباط بین الگوریتم بهینه‌سازی HBMO و شبیه‌ساز هیدرولیکی EPANET استفاده شد. نتایج به‌دست آمده حاکی از کارآمدی مدل بهینه‌سازی توسعه داده شده به‌منظور یافتن برنامه زمانی بهینه تأمین نوبتی است. به‌طوری که حتی در شرایط تنش آبی بسیار شدید نیز مدل ارائه شده، آب موجود را به‌صورت 100 درصد عادلانه همراه با رعایت انصاف، بین مصرف‌کنندگان توزیع نمود. Under water shortage conditions, it is necessary to exercise water consumption management practices in water distribution networks (WDN). Intermittent supply of water is one such practice that makes it possible to supply consumption nodal demands with the required pressure via water cutoff to some consumers during certain hours of the day. One of the most important issues that must be observed in this management practice is the equitable and uniform water distribution among the consumers. In the present study, uniformity in water distribution and minimum supply of water to all consumers are defined as justice and equity, respectively. Also, an optimization model has been developed to find an optimal intermittent supply schedule that ensures maximum number of demand nodes are supplied with water while the constraints on the operation of water distribution networks are also observed. To show the efficiency of the proposed model, it has been used in the Two-Loop distribution network under several different scenarios of water shortage. The optimization model has been solved using the honey bee mating optimization algorithm (HBMO) linked to the hydraulic simulator EPANET. The results obtained confirm the efficiency of the proposed model in achieving an optimal intermittent supply schedule. Moreover, the model is found capable of distributing the available water in an equitable and just manner among all the consumers even under severe water shoratges. Afshar, A., Bozorg Haddad, O., Mariño, M. A. & Adams, B. J., 2007, "Honey-bee mating optimization (HBMO) algorithm for optimal reservoir operation", Journal of Franklin Institute, 344(5), 452-462. Alperovits, E. & Shamir, U., 1977, "Design of optimal water distribution systems", Water Resour. Res., 13(6), 885-900. Ameyaw E. E., Memon Fayyaz A. & Bicik J., 2013, "Improving equity in intermittent water supply systems", Journal of Water Supply: Research and Technology, 62(8), 552-562. Andey, S.P. & Kelkar, P.S., 2009, "Influence of intermittent and continuous modes of water supply on domestic water consumption", Water Resources Management, 23(12), 2555-2566. Batish, R., 2003, "A new approach to the design of intermittent water supply networks", World Water and Environmental Resources Congress, Philadelphia, Pennsylvania, United States. Bozorg Haddad, O., Adams, B. J. & Mariño, M. A., 2008, "Optimum rehabilitation strategy of water distribution systems using the HBMO algorithm", Journal of Water Supply Research and Technology, 57(5), 337-350. Bozorg Haddad, O., Afshar, A. & Mariño, M. A., 2008, "Design-operation of multi-hydropower reservoirs: HBMO approach", Journal of Water Resources Management, 22 (12), 1709-1722. Bozorg Haddad, O., Afshar, A. & Marino, M., 2010, "Multireservoir optimization in discrete and continuous domains", Proceeding of the ICE - Water Management, 164 (2), 57-72. Bozorg Haddad, O., Afshar, A. & Marino, M.A., 2006, "Honey-bees mating optimization (HBMO) algorithm: A new heuristic approach for water resources optimization", Water Resources Management, 20(5), 661-680. Choe, K. & Varley, R., 1997, "Conservation and pricing-does raising tarrits to an economic price for water make the people worse? ", Prepared for the Best Management Practice for water conservation workshop, South Aerica. Duckstein, L. & Plate, E.G., 1988, "Engineering reliability and risk in water resources", Clean-Soil, Air, Water, 16(4), 451-452. Ghajarnia, N., Bozorg Haddad, O. & Marino, M. A., 2009, "Reliability based design of water distribution network (WDN) considering the reliability of nodal pressure", World Environmental and Water Resources Congress, Great Rivers, Kansas City, Missouri, USA, 5717-5725. Hashimoto, T., Stedinger, J.R. & Loucks, D.P., 1982, "Reliability, resiliency, and vulnerability criteria for water resource system performance evaluation", Journal of Water Resources Research, 18(1), 14-20. Jahanshahi, G. & Bozorg Haddad, O., 2008, "Honey-bee mating optimization (HBMO) algorithm for optimal design of water distribution systems", World Environmental and Water Resources Congress, Honolulu, Hawaii, United States. Jeong, H.S. & Abraham, D. M., 2006, "Water rationing model for water networks under short-term water supply shortage", Pipelines Division Specialty Conf., Chicago, Illinois, United States. Karimi, S., Mostoufi, N. & Soutodeh Gharebagh, R., 2013, "Evaluating performance of Honey bee mating optimization", Journal of Optimization Theory and Applications, DOI: 10.1007/s10957-013-0336-2. Lund, J. R. & Reed, R., 1995, "Drought water rationing and transferable rations", Journal of Water Resources Planning and Management, 121(6), 429-437. Marinakis, Y., Marinaki, M. & Matsatsinis, N., 2008, "A hybrid clustering algorithm based on honey bees mating optimization and greedy randomized adaptive search procedure", Learning and Intelligent Optimization, 5313, 138-152. Marinakis, Y., Marinaki, M. & Matsatsinis, N., 2008, "Honey bees mating optimization for the location routing problem", Engineering Management Conference, IEMC Europe 2008. IEEE International, Estaril. Mohan, S. & Jinesh Babu, K. S., 2010, "Optimal water distribution network design with honey-bee mating optimization", Journal of Computing in Civil Engineering, 24(1), 117-126. Naik, B., Nayak, J. & Behera, H. S., 2015, "A honey bee mating optimization based gradient descent learning – FLANN (HBMO-GDL-FLANN) for Classification", Emerging ICT for Bridging the Future - Proceedings of the 49th Annual Convention of the Computer Society of India CSI, Volume 2, Advances in Intelligent Systems and Computing, 338, 211-220. Nasseri, M., Moeini, A. & Tabesh, M., 2011, "Forecasting monthly urban water demand using Extended Kalman Filter and Genetic Programming", Expert Systems with Applications, 38(6), 7387-7395. Nazif, S., Karamouz, M., Tabesh, M. & Moridi, A., 2010, "Pressure management model for urban water distribution networks", Water Resources Research, 24(3), 437-458. Niknam, T., 2009, "An efficient hybrid evolutionary algorithm based on PSO and HBMO algorithms for multi-objective Distribution Feeder Reconfiguration", Journal of Energy Conversion and Management, 5(8), 2074-2082. Seifollahi-Aghmiuni, S., Bozorg Haddad, O., Omid, M.H. & Mariño, M.A., 2011, "Long-term efficiency of water networks with demand uncertainty", Proceedings of the Institution of Civil Engineers: Water Management, 164(3), 147-159. Seifollahi-Aghmiuni, S., Bozorg Haddad, O., Omid, M.H. & Mariño, M.A., 2013, "Effects of pipe roughness uncertainty on water distribution network performance during its operational period", Water Resources Management, 27(5), 1581-1599. Soltanjalili, M., Bozorg Haddad, O. & Marino, M.A., 2013, "Operating water distribution networks during water shortage conditions using hedging and intermittent water supply concepts", Journal of Water Resources Planning and Management, 139(6), 644-659. Sushikumar, N., Mohankumar, M. S. & Sridharan, K., 2003, "Modelling an intermittent water supply", World Water and Environmental Resources Congress, Philadelphia, Pennsylvania, United States. Tabesh, M. & Dini, M., 2009, "Fuzzy and neuro-fuzzy models for short-term water demand forecasting in Tehran", Iranian Journal of Science and Technology, Transaction B, Engineering, 33(1), 61-77. Tabesh, M. & Saber, H., 2012, "A prioritization model for rehabilitation of water distribution networks using GIS", Water Resources Management, 26(1), 225-241. Tabesh, M., Shirzad, A., Arefkhani, V. & Mani, A., 2014, "A comparative study between the modified and available demand driven based models for head driven analysis of water distribution networks", Urban Water Journal, 11(3), 221-230. Totsuka, N., Trifunovic, N. & Vairavamoorthy, K., 2004, "Intermittent urban water supply under water starving situation", 30th WEDC International Conference, Vieutiane, Lao PDR. Vairavamoorthy, K., 2010, "Water conservation in developing countries", Presentation at Water, Engineering and Development Center (WEDC), Loughborough University, UK. Vairavamoorthy, K., Gorantiwar, S. D. & Pathirana, A., 2008, "Managing urban water supplies in developing countries-climate change and water scarcity scenarios", Physics and Chemistry of the Earth, 33(5), 330-339.
WHO, UNICEF, & WSSCC, 2000, Global water supply and sanitation assessment- 2000 report, WHO, Geneva, Switzerland.